Good to see the Council agreed that to move forward with an Outline Business Case at the least. 2. Agreed to instruct the Head of Facility Services to prepare a Project Initiation Document setting out the scope, process, timetable and resources required to undertake the OBC for consideration by the Campbeltown CHORD Project Board and then the Programme Management Board. I began to read the posts on this subject yesterday evening. From looking at the problem from a distance it is quite clear that an all-weather pitch would be great asset to the town. What I have also noticed in quite a few of the post's is that a lot of the writers of which, are more concerned with the adult football sides being able to fulfill there SAFL fixtures during bad weather, so does that mean that they would get first refusal on the pitch than say a bunch of children who want to play. Im not against the local sides in the town in the slightest as what they do for the local community is very good. Im not to sure how long the local groups/councils have been asking for the AWP, but has anybody actually tried to raise money or apply for funding or are you all going to sit infront of your computers and moan that Campbeltown doesnt get anything and is always last in line for anything. Or do people forget (new swimming pool, welcom/vestas, town centre regeneration, new police station, new houses being built, new golf course, skate park). What im basically saying is that somebody, or some group should grab this by the balls and really go at it. Idontbelieveit - Good to see fresh contributions to this debate and campaign. I didn't reply after reading your e-mail as I thought perhaps it would stiffle more debate and questions etc. The fortunate position is the Council completed an Outline Business Case (OBC) in 2008 so it is already extensive. It looks like there will be a meeting of local interested parties etc (stakeholders) in mid February which will be facilitated by Argyll & Bute Council and I suspect will see attendees from SportScotland, SFA etc. All in all the OBC is expected to be completed by April and at the same time an application will be made to SportScotland for funding. idontbelieveit wrote: What I have also noticed in quite a few of the post's is that a lot of the writers of which, are more concerned with the adult football sides being able to fulfill there SAFL fixtures during bad weather, so does that mean that they would get first refusal on the pitch than say a bunch of children who want to play. Im not against the local sides in the town in the slightest as what they do for the local community is very good. The AWP isn't something that is free to use so the pitch will have to be booked etc (so teams simply won't get it before kids and anyway there are only so many times teams and clubs can afford to play on one of these a week). idontbelieveit wrote: Im not to sure how long the local groups/councils have been asking for the AWP, but has anybody actually tried to raise money or apply for funding or are you all going to sit infront of your computers and moan that Campbeltown doesnt get anything and is always last in line for anything. What im basically saying is that somebody, or some group should grab this by the balls and really go at it. This question has been raised before at our meetings but this would be an unbelievable task and burden for any local community to take on. We are talking about raising anything from £650,000 to £1.3 million here. The facility then would become a community enterprise and you only need to look at the situation in Lochgilphead with regards the pool to ask why anyone or group would burden themselves with this? AND we have to ask ourselves if the Council has provided these facilities the length and breadth of Argyll why should Campbeltown deliver one themselves? There are plenty of comments on here about this but it was just to say that we aren't all sitting behind a computer screen doing nothing about it. In fact the next few weeks could prove to be vital to the delivery of an AWP so please support our campaign. So please start by adding your name to our on-line petition. PMR Leisure has been appointed to undertake Argyll & Bute Council’s Facility and Playing Field Strategy in partnership with sportscotland and will also assist the Council’s All Weather Pitch Project Team to complete the Stage 1 application to sportscotland in April. This application will give the project formal feedback on sportscotland’s view – and will act as a barometer for the likelihood of gaining matching funding from them. PMR are also planning to visit Campbeltown week commencing 1st March and details on this visit will appear here, on the Kintyre Forum. The week after the group will take advantage of the CHORD public consultation day to feedback where the project is and get further public view. Thursday’s meeting will be held at the conference room at the Aqualibrium at 7:00pm. Consultancy company PMR Leisure ( http://www.pmrleisure.co.uk/), who are working on the Council's Facilities and Playing Field Strategy, will complete the Stage 1 application on behalf of the Council to SportScotland for potential funding of the All Weather Pitch. 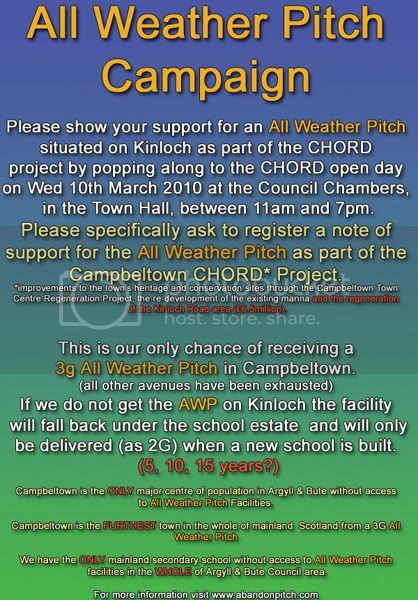 There will be an open meeting of the CHORD project in Campbeltown in March and this will be a good oportunity for the local community to support the AWP on Kinloch Green. Is this just all talk or is there a feeling something is actually going to happen? It makes sense to be on Kinloch Road especially next to the Aqualibriuim. Interesting to note the switch to Kinloch Park when you read back and see some resistance from years before and most notably some of the ones who are vocal on this forum about it. smiles wrote: Interesting to note the switch to Kinloch Park when you read back and see some resistance from years before and most notably some of the ones who are vocal on this forum about it. smiles - will get back to you on this. There are a number of reasons for this. Perhaps you'd come along to the meetings and find out more? I'll also get back to you with regards a previous comment about "what the Sports Council do too" as added to a comment made last night at the meeting that has pissed me off. On another note, and more important note, the one thing the Council will have to do is build a business case in terms of usage of a possible AWP in Campbeltown. Outwith the sports clubs in Campbeltown are there any groups who would informally use the pitch for a kick about - with a group of mates, work pals etc - based on a third of the pitch at £15 per hour (that is an attractive price given the costs for grass pitches and the Vic). Think there are a number of lads who get together informally for 5s in the Vic so these are the types of groups that would be target users etc and of course any groups who say the would form due to have an AWP. We really do need your support, please do go along and say you support the provision of an AWP. Please. This is our only opportunity for a 3G pitch in Campbeltown. I may be way off the mark, and it is one of the bees in my bonnet, but regarding fund raising, why can the Scottish Government find money for Gigha residents to buy the island(presumably a "class war" thing) and no money for the much larger community of the town to aid in the healthy future of the young (and not so young)? Argyll & Bute Council confirmed they have submitted a Stage 1 application to SportScotland for the provision of an All Weather Pitch in Campbeltown. Council will hear the outcome of that in 4 weeks by the start of May. Kintyre Forum News wrote: Argyll & Bute Council confirmed they have submitted a Stage 1 application to SportScotland for the provision of an All Weather Pitch in Campbeltown. Council will hear the outcome of that in 4 weeks by the start of May. Some light at the end of the tunnel? We certainly hope so! SportScotland have indicated that following the Stage 1 Application submitted by Argyll & Bute Council that they will support the provision of an AWP on Kinloch Green with new changing rooms to the sum of £350,000! The Council have already appointed PMR Leisure to submit the Stage 2 Applicati...on by the end of the summer. Now all we need is the Council to add the other 50% to their capital programme!! Sportscotland have invited Argyll & Bute Council to compete for funding for an all weather sports pitch in Campbeltown from their Sports Facility Lottery Fund. The project was approved in principle at sportscoltland’s recent Sports Facility Fund meeting as a ‘high priority’ application and the second stage of the process involving detailed costing, specification, planning and operation can now be progressed. The All Weather Pitch has been a high priority of the Kintyre sporting community and has wide support from sports groups including South Kintyre Sports Council whose campaign has helped convince the lottery board of its need. Similar developments in other parts of Argyll and Bute through both the NPDO Schools programme and lottery funded projects have helped dramatically increase the number of people active in sport as well as increase the number of sports coaches. The Campbeltown All Weather Pitch is intended to be sited adjacent to Aqualibrium on Kinloch Green and will be operated as part of the leisure centre. The project also includes the refurbishment of the Kinloch Green changing pavilion to allow team changing. The completed facilities will be used by sports organizations, schools, Active Schools and casual users who will be able to book the pitch or a section of the pitch through Aqualibrium. The development has been part of the emerging Sports Facility and Pitches Strategy for Argyll and Bute which is due for completion in June 2010 and will contain recommendations and plans for the future use and development of the Council’s stock of facilities as well as highlight potential developments over the next ten years. The Council now have a real opportunity to provide a top class sporting facility and would be stupid to throw away the opportunity of nearly 50% funding. Looks like the CHORD project isn't an option (which is a real shame as it would be shining example of the project but hey ho! ) so the pressure has to be put on to the Council to ensure this forms part of their capital programme for 2011 when they put this together in October.